A Champagne Toast awaits You at Sunset Hill. This is a once in a lifetime opportunity to ride on a western horse and see the icon of the west, the buffalo, roaming in its natural environment. All the horse rides are designed for beginners; the horses are gentle and well trained and suitable for all ages. (age 9 and over). Comfortably seated in your authentic western saddle you will follow your guide through the Joshua Trees lining the historic Mormon Trail and up to Buffalo Point. 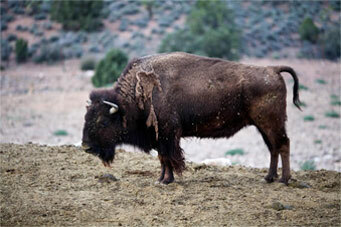 You will have the opportunity to photograph wild buffalo and panoramic views of Spirit and Iron Mountain. Sunset Horse Ride Option: Includes an extended ride, cowboy entertainer serenading you with songs of old and a champagne toast or soft drink at Sunset Hill. It is the perfect Arizona moment that you will never forget looking west with the sun setting, the silhouette of buffalos and views of the mountain ranges stretching on most days over 100 miles. 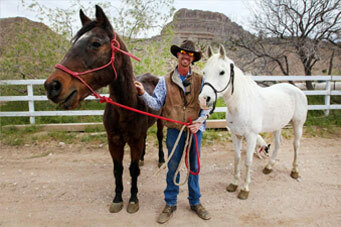 Guided horseback along the Joshua Tree Forest. Ride a quarter horse as seen in the Wild West movies! Track down Buffalo for camera photo opportunities! View Wild Buffalo in their natural environment. Ride to the spectacular Buffalo Point or Sunset Hill. Approx. 45 min - 1 Hour ride time; "Cowpoke" must be age 8 and over, NO minimum height restriction and NO weight limit. Pony rides available for kids ages 7 and under. Suitable for all riders of varying experience. Step back in time on The Old Mormon Trail. Climb aboard a covered wagon drawn by two beautiful Belgian Draft Horses. Go back in time as you follow the old Mormon trail like the pioneers did long ago. As you climb through the Joshua tree forest your cowboy guide will fascinate with tales of the history and wildlife of this historic ranch. On arrival at Buffalo Point you will be in awe as you get your first views of the majestic icon of the west, the Buffalo. Having the opportunity to see these animals that used to roam the plains in their millions and hear the story about their near extinction at is an experience of the west definitely not to miss. From over seventy million animals to under three hundred in 25 years is a near extinction story as important to share with your family as the story of the whales. 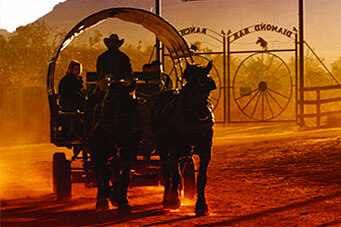 Board an authentic wagon for a journey on the Historic Mormon Trail. 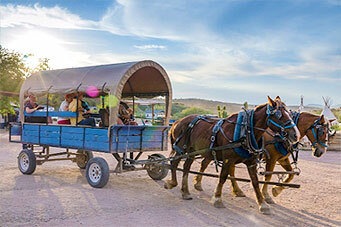 Experience a guided horse-drawn wagon ride along the tree lined Joshua Tree Forest. Ride to the spectacular Buffalo Point or Sunset Point (Sunset Ride). Approx. 45 min - 1 Hour ride time; NO minimum age or height restriction and NO weight limit. Suitable for the whole family! This is the ideal location to be a "City Slicker." Stay an extra night and experience this incredible overnight campout. Saddle up your horse and enjoy the centuries old traditions of the American cowboy as you step back in time on a guided overnight campout... an adventure not to be missed! Your journey starts as you ride through the Joshua Tree-lined Mormon trail, through the Iron Basin known as the Music Mountains of Arizona. 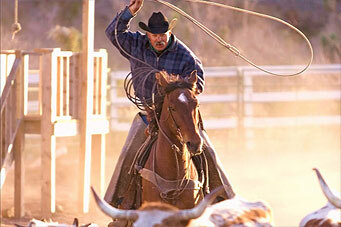 Enjoy the spectacular panoramic views of Spirit Mountain as you climb into the vastness of the open range. At sunset you will reach your rustic Cowboy camp where a cold beverage awaits. Chow down on home cooked western cuisine while you relax in the company of your fellow Cowboys and Cowgirls. 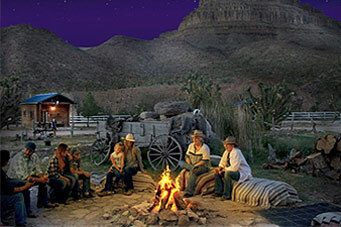 Relax under a canopy of stars and relive the history and stories of the outlaws from the Old Wild West. Just after Sunrise and a freshly made cup of Cowboy coffee, it's time to saddle up and head back to the Ranch house for a hearty breakfast. Your overnight campout adventure promises to the be highlight of your vacation! Your own Western quarter horse. Overnight stay at Cowboy Camp. Western-style meal including dinner and breakfast. Panoramic views of Iron Basin, Spirit Mountain and Music Mountains of Arizona. Departs at noon from the Ranch. Please allow approximately 19 hours Ranch House to Ranch House. Notes: Appropriate clothing and footwear advised, including long sleeved shirt, windbreaker, Cowboy hat, jeans, strong walking shoes. Must be age 9 and over, min. height 52" to participate in horseback ride. Suitable for all riders of varying experience. 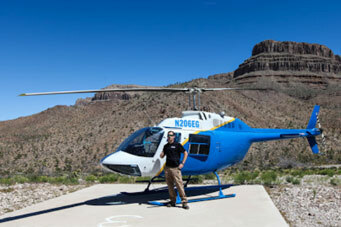 Fly in a Helicopter directly from the Grand Canyon Western Ranch and experience a 20-25 minute flight through the grand Canyon that gives you an up close view of Guano Point, Eagle Point, and the Skywalk. You will be approximately 2,000 feet below the rim of the Grand Canyon giving you breathtaking views over the Colorado River. You will also see Joshua Trees and other cacti with the possibility of some elk or wild horses. 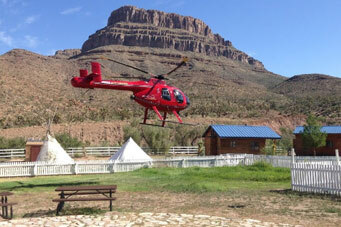 Your flight will then return to the Ranch where other activities and amenities are available for your enjoyment. 20-25 min ride over the Joshua Tree Forrest and Hualapai Reservation, then into the Grand Canyon and back. 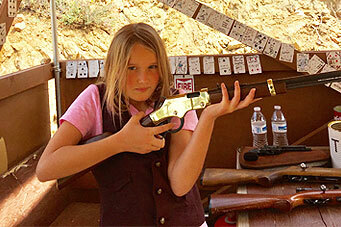 Visit our Western Gun Range where the firearms are in the style of the Old West including Lever Action Rifles and Single Action Revolvers and where guests are supervised by experienced and trained instructors. 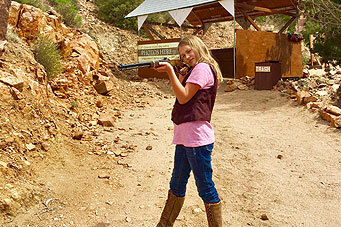 Our firearms have very little recoil and are suitable for guests 12 years and older. Pre-paid packages are available with or without photo opportunities. Usually takes about an hour for 2 people.